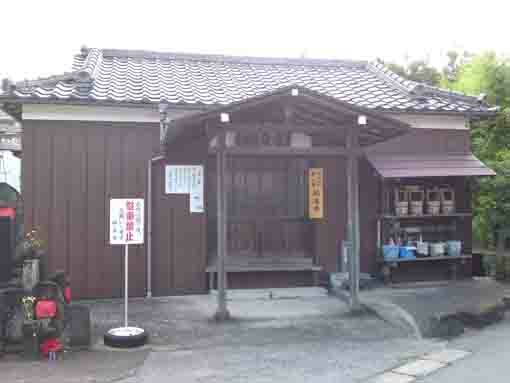 In the south of Baraki Interchnge of Keiyo Highway, there is Gyotokusan Fukusenji Temple, the 2nd temple of the 33 Pilgrimages in Gyotoku and Urayasu, along a narrow crowded street. Though it has only a small hat in it, it tells that Gyotoku area had spread here in Futamata and Funabashi City, the area Gyotoku in Edo period had been the almost same as the area Tozai Line running from Urayasu to Nishi-funabashi Station on. And also the land Futamata appears on the book 'Nanso Satomi Hakkenden (the Biography of Eight Dogs), so it was very popular in Edo Period. Why don't you visit Gyotokusan Fukusenji Temple? Gyotokusan Fukusenj Temple is said to be moved from Kongoin in Hongyotoku. Edo Meisho Zue (a guide book describing Edo in Edo period) introduced Kongoin Temple where a monk named Gyotoku who worked hard to develop local industry and to enlighten had lived in early Edo period and the area name Gyotoku was named after him, so Gyotokusan Fukusenji Temple has succeeded this temple. About 100 years from Genroku to Kansei Era, Fukusenin Temple succeeded it since the 33 Pilgrimages in Gyotoku and Urayasu organized in Genroku Era (1688 - 1703) and Edo Meisho Zue that introduced as Kongoin Temple had abandoned published in Kansei Era (1789 - 1801). 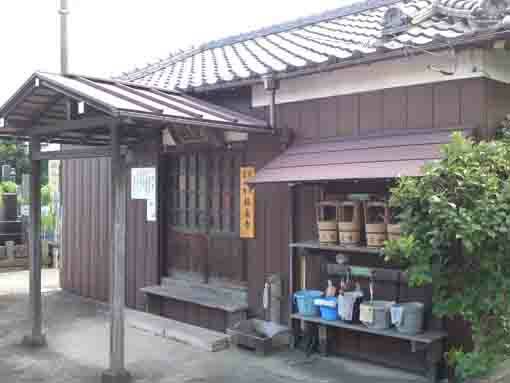 Moreover, Gyotokusan Fukusenji Temple is the 2nd temple of the 33 Pilgrimage in Gyotoku and Urayasu. Gyotokusan Fukusenji Temple has great accessibilities from both Narita and Haneda International Airport. From Narita International Airport, take JR Sobu-express line, transfer the line at Funabashi to Sobu line bound to Nakano or Mitaka, get off Nishi-funabashi Sta. And also take Keisei-line, transfer the line at Funabashi to Sobu-Local line, get off Nishi-funabashi Sta. It takes minimally 40 minutes from Narita Airport. From Haneda International Airport, take Keikyu-line bound to Narita, and get off Keisei Nishi-funabashi Sta. Or From Haneda International Airport, take Keikyu-line bound to Narita, transfer the line at Nihonbashi to Tozai line of Tokyo Metro bound to Nishi-funabashi, Tsudanuma or Katsutadai, get off Nishi-funabashi Sta. Take 10 minute walk from Nishi-funabashi Sta.